Finally came together for my 13 year old in the final hour of the last day of muzzleloader season. Been a long grueling smokepole season. We saw tons of does every day and at least a buck or two each of the 6 days we hunted. Never able to seal the deal for him. My boy had bucks in the sights a couple times but didn't feel good about the shot (fantastic he has that kind of self restraint). He was getting more and more bummed as each evening's shooting ended and the end of the hunt loomed closer. Told him we could run up for the final evenings hunt, you cant kill one from home so lets run up. We were the only ones on the mountain and immediately got into deer. It was COLD, by 5:30pm puddles in the road were freezing over but we had winter clothes with us. Finally we came back past a place we'd already been through and as luck would have it, 2 bucks were feeding through a meadow at 90 yards. Buck fever immediately took over and I had to help him cap the gun. We closed the distance to 70 yards and got him set up on SteadyStix. Seemed forever to me before he touched off the gun but it was a fantastic shot, right on target.Deer went on a death run from hell though, 200 yards of tracking it in the now failing light, but we caught up with it in short order. It's cool for a dad to watch a kid go through this, mighty proud of him. Seen bigger bucks we almost got but he was pretty excited with this guy. Best of all, I made him field dress it... his first time. He did a great job at that as well. I see you know the trick to get your family smiling. And as always: the more time it takes and the more difficulties you have, the nicer the result at the end. great stuff, and now you have him learning the knife work bit life just gets better, soon you should be able to sit back in the sun and drink beer while watching the others cut em up . yeah nah its to good being able to do the job together, sure makes it faster and easier. Buck fever...he can now say "been there, done that, beaten it once, nothing to it, can beat it again"
congrats to you both for sticking with it and heading out. freezing puddles? Not that cold down here yet. Our hunting large game season hasn't even started yet and you and your family have already had some great hunts! We had fresh snow here 2 months ago, lol. But as it stands, 3 of 5 big game tags filled so far this year. Might try to get my boys cow elk done this weekend, and he has an out of state Wyoming antelope tag to fill by the end of the month. 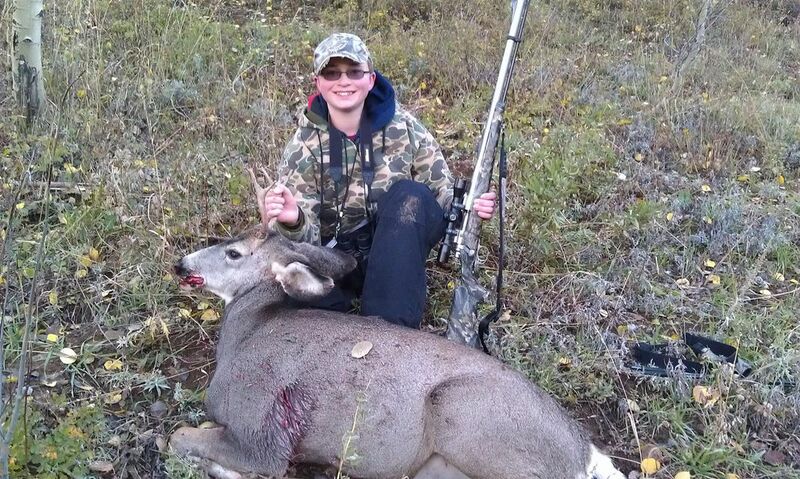 He's a lucky kid, killed more stuff right now than I did my first 3-4 years hunting. what a nice deer, Weldone!! That is great Dallan...give your young fella a pat on the back from all of us, he has certainly earned it mate. I can see why you would be a proud Dad, he has these skills because you taught him. Also, you have instilled the right ethics in him as well...you have every reason to be proud mate. That is a nice fat healthy looking buck mate, so damn fine eats for sure. It's good you have taught him to dress out his own kills, now all he has to do is learn the butchering skills. Great job by both dad and son. Memories are thus made.